Screen doors take a beating as they open and close. Add children or pets to the mix, and you end up with a sure-fire recipe for screen damage. An over-exuberant dog especially can result in a screen tear that will need to be fixed. Fortunately, repairing a screen door and getting professional-looking results are easy if you follow the steps laid out for you in this tutorial. 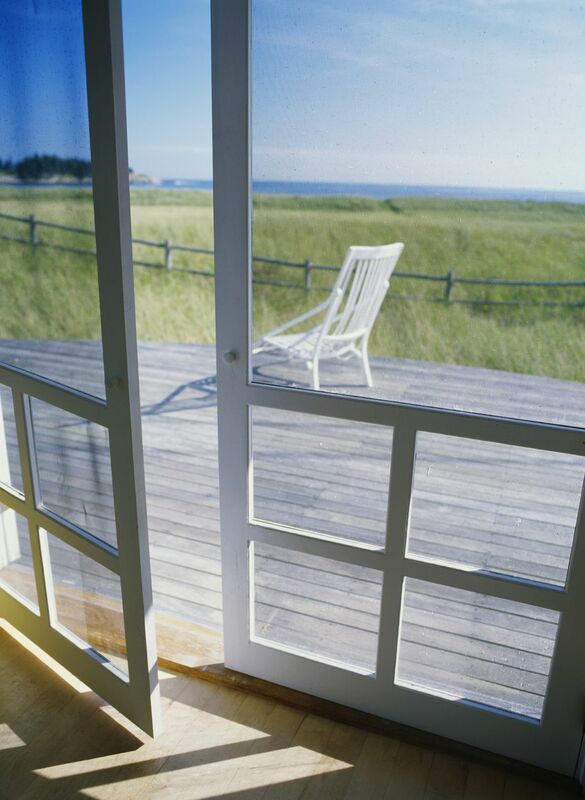 Some aluminum frame storm doors have interchangeable inserts—glass inserts for winter and insect screens for the warm seasons. If you have this kind of door, then to replace the screen, you need only remove the screen insert to work on it. For this tutorial, though, you'll learn how to repair an aluminum screen door where the screen is integral to the door, requiring that you removed the entire door from the frame. Screen fabric can be made either of aluminum or fiberglass and is held in place within the window frame using a simple, flexible gasket called a retainer spline. The plastic retainer spline is installed using a specialty tool, called a spline (or screen) installation tool. So let's take a look on how to replace a screen in an aluminum screen door. NOTE: Replacing screens on a wooden screen door uses a slightly different process. For information on how to repair a wooden screen door that uses staples instead of retainer spline to fasten the screen, see Screen Repair - Wood Frame. Removing the screen door so you can work on it can be confusing. There can be many screws on an aluminum door frame, and taking the door off is not necessarily intuitive. Disconnect any door closers or safety chains on the door. Remove the screws that hold the door jamb on the hinge side of the door to the aluminum frame. You will probably need a Phillips-head screwdriver. There are usually three hinges on the door so expect to find at least six screws. Once the screws are removed, the door should easily detach from its frame. Again, if you have a storm door with removable glass and screen inserts, then you do not have to remove the door. You remove the screen insert. Next, carefully move the door (or screen insert) into the work area for the next step. When repairing a screen door, you need a large flat surface on which to work. In this example, we used an old flush door placed on top of a pair of sawhorses, but you can also use a sheet of smooth plywood on saw horses. It is important the work surface is at convenient working height and is flat and large enough to cover the screen door. Using a small screwdriver (or a nail), pry up and remove the old spline from the frame. If it is in good shape (not brittle, dried out or broken) and comes out intact, it may be carefully reused. Usually, though, you'll replace it. If the spline needs replacement, use new vinyl spline material that is the proper width and color for use with the frame. Once the spline is removed, remove the old screen fabric from the frame. TIP: The spline installation tool will have two rollers, one on each end; one is concave and the other convex. Metal screen installation will use both ends—the convex roller end to press the metal screen into the frame groove and the concave roller end to press the plastic spline into the groove. But with fiberglass screens, as we will use here, you use only the concave roller end to press the spline into the groove. Next, roll out the replacement screen down the length of the screen door frame and cut it to about the length of the door. Then trim the screen, so it extends about 2" further on all sides past the spline groove in the frame. The screen will be further trimmed once the retainer spline is installed. Installing the screen in the frame takes a little patience and care, but is pretty easy. With the screen position loosely over the frame and overlapping the spline groove all around, begin at a top corner and press the retainer spline down over the screen fabric and into the spline groove on the frame. (There should be 1"-2" of excess screen fabric extending past the groove.) Use the spline installation tool to set the spline into the groove partially, but do not fully embed it yet, so that you can easily remove the spline if you need to reposition the screen. Work your way down one long side of the screen, pulling gently on the screen fabric to make it taut as you install the spline and use the spline roller to press it into partially into the groove. Repeat this process on the top of the frame. You now have two sides loosely installed. Do not fully press the spline into the track at this time. With these two sides installed, move to the long opposite side and, starting at the top again, gently pull the screen fabric, so it is slightly taut across the frame, and secure it with spline embedded loosely into the spline grooves. You should see the screen take on a nice smooth appearance as you work your way down the side of the frame. If you see a pucker or slack area appear, it is because you are changing the tension or tautness of the screen as you are rolling the spline into place. If a pucker appears, gently lift the offending section of spline out of the track and reinstall. Complete the initial installation by repeating the process on the bottom of the screen. Once all sides are complete, and the screen is smooth, press the retaining spline fully into place, using the spline installation tool. This will cause the screen to tighten across the frame a little bit more. Be careful not to cut the screen when rolling the spline into position. You will have some extra spline at the final corner as you wrapped your way around the screen door frame. Trim this extra away with a razor blade. Trim the extra screen material right at the edge of the retaining spline with a razor blade, creating a neat appearance. Once the screen is properly installed, it will look smooth and fairly taut, without wrinkles or sags. Once the screen is repaired, reinstall the door reversing the process of Step 2. Your job is done, and the screen door looks great. Ready for another assault by kids and dogs!